 The Ravensburger african animals puzzle features african animals.  Large puzzle pieces and durable. 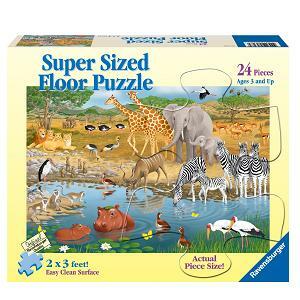 The Ravensburger African Animals puzzle (ages 3 and up) is designed for younger children. It is made of large pieces and from the highest quality material. It features a serene Serengenti scene of zebras, monkeys, elephants, etc, perfect if you want your little one to learn about animals. By putting this puzzle together, younger children learn about African animals. They also develop problem-solving skills as they have to figure out how the puzzle pieces fit together.